Most people know the story by now: Turbo wasn’t supposed to be so lite. It was originally supposed to be a double album called Twin Turbos, featuring a mix of styles from ballads to hard rock to heavy metal. When the record company balked, they put the most commercial stuff out as Turbo, saving the rest of the songs for later use. Some, such as the awesome “Heart of a Lion” (later covered by Scott Travis’ band Racer X) and “Red White & Blue” ended up on Priest box sets and remasters. Other songs such as “Ram It Down” were re-recorded with a heavier sound and put out on the next album. If you’re one of the many who considers Turbo one of the worst (if not the worst) Judas Priest album, I get it. It was their “sell out” album. It’s cold, it’s synthetic, it’s somewhat soulless. I understand. However, I tend to look at the Judas Priest back catalog, the complete gestalt, if you will, as one whole. 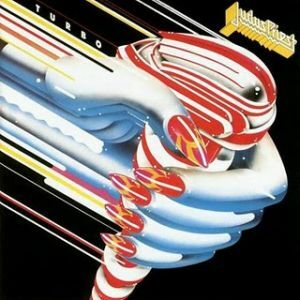 Looking at this album in context, it is clear that Turbo is a unique record in Judas Priest’s canon, and indeed the whole of heavy metal in general. There’s never been an album that sounds quite like Turbo and it’s likely that there never will be again. Turbo came in ’86 while Priest decided to experiment with guitar synthesizers. These are not keyboards on this album, but guitars played through a synth. Priest have done it since (Ram It Down, Nostradamus) but never again to this degree. Some of the sounds on this album are really cool. That weird vacuum cleaner combined with a jet engine sound in the opening of “Turbo Lover”, for example? Cool. The songs are also good, albeit commercia hard rock. Priest had been increasing the commercial tendencies ever since British Steel, but on Turbo it veered heavily into MTV territory. “Turbo Lover” is an example of this. There’s not much in terms of a riff, which used to be the bedrock of a Priest song. The melody is the framework on which you hang the cool sounds and robotic groove. But it works, and the song is often brought out into the setlist, still — the only song from Turbo to make the setlist post-1987. “Locked In” is a bit more rockin’, not a great song, but at least it ups the tempo a bit. The shout-chorus of “Private Property” is catchy as hell and this could easily have been a single. It sounded great live with the crowd joining in. “Parental Guidance”, was probably my favourite Priest song in ’86-87. It’s just really catchy. It’s not heavy metal, but it’s really well-written pop metal. And as kids, we dug the words, even though Halford was 35 years old when he wrote them! “Rock You All Around The World” closed side one, a fast number designed to get the crowd going nuts in concert. Sounds like Scorpions to me. Side two started off with the long, dramatic epic, “Out in the Cold”. Man, what a great song. This one opened the live show in 1986 (and the following live album, Priest Live). I guess this would technically be the ballad of the album! A pair of so-so songs follow, “Wild Nights, Hot And Crazy Days” (sounds like Van Hagar) and “Hot For Love” (another fast one that could have been covered by Scorpions). Not great songs, but at least they’re rockers. “Wild Nights” is kind of one of those 80’s party rockers. Nothing special, but it suited the times. The final song is a total winner, “Reckless”, written for the Top Gun soundtrack but held back for this album. Awesome tune, “coming at galeforce ten.” This is just a perfect rock song for Judas Priest. Not a metal song, a rock song. It’s as aggressive as it gets on this album and it has a great solo, too. There are two bonus tracks on the current remastered edition, “All Fired Up” (a lacklustre outtake) and a live version of “Locked In”. Since “Locked In” didn’t make 1987’s Priest Live album, it makes good sense to include it here. It was a single/video, released at the exact same time as “Turbo Lover” but always remained in that song’s shadow. Good to finally have a live version. Liner notes and pictures are included. This album also contains the infamous “lead break credits”! While I don’t know if Glenn and Ken are interesting enough guitar players to warrant lead break credits for every song, it was a feature I enjoyed at the time and helped me identify the individual styles of the two players. ← DEEP PURPLE News: Ezrin brings the choir! I’m not as familiar with this one as your good self but I’ve never had a problem with it either. It’s not their best by any stretch but it’s nowhere near their worst. I especially liked Out in the Cold and thought it was a really brave and interesting concert opener. I always though there were some songs on Defender like Love Bites that could have fit on Turbo so it’s not like the style change was totally out of the blue. This is one of those albums where I wonder if people were listening with their eyes, do you know what I mean? Their image and presentation at this point was ill-considered. I can’t really remember what they looked like circa Defenders mind you… but when I watch the Priest Live footage it’s pretty embarrassing. But in hindsight…KK’s perm…not good. I like Glenn’s hair. I wanted his hair at the time, and their leather jackets. I thought those were the BEST! That’s interesting. Glenn kept his cool at least. I thought Rob looked awful with hair. and KKs perm and stage antics (keep your tongue in, your not Gene Simmons) left a lot to be desired. I have nothing against that type of image, I just thought it was wrong for them and a big risk to change sound and image at the same time. The tongue!! I forgot about that! Lord don’t remind me of that. I haven’t watched Priest Live in many, many years. I should see how well it’s aged. I would agree with that. I think it’s generally a better album than its given credit for. I know I read Glenn say he thought it was over produced, and he preferred the way they did it on Unleashed. It’s a fair point but it still sounds great. With hindsight it’s probably got too much Turbo stuff on it, I suppose they had hoped that material would become more classic than it has. But there is so much amazing stuff on here that came after Unleashed that made it on here. And they sealed the deal with the sweet bonus tracks. Can’t understand why those songs didn’t make it on it in the first place! Just running time I assume? Double vinyl and all. I could done without the singalongs at the end, and put on the bonus tracks! A buddy of mine prefers the Priest Live home video version of Manalishi to any other. He would have rather had that on the album. Personally I like Priest Live…another album I need to get around to…and it was in my walkman for the entire summer of 1987, non-stop. Aye, it would have been the running time… but I think they should have cut even one or two of the Turbo tracks to make room for more classic fare. What were they thinking leaving Hell Bent for Leather off it? That’s like KISS leaving Detroit Rock City off Alive II do you know what I mean? I’ll need to put that Manalishi version on again! Hypothesis: They left off Hell Bent because they wanted no overlap with Unleashed? To use your analogy, the Alive II method? No overlap with Alive I? Would Hell Bent have been on Unleashed at that point? Was that not a later bonus track from an EP or something? It’s not a great analogy though, admittedly! For some reason I’d convinced myself that Hell Bent was on British Steel. D’oh. Anyhoo, still think they could have replaced Private Property and or Parental Guidance with something more classic and it would have aged better. But I agree it gets an unfair bad rep. Most bands would kill to have a set like that. Yeah you’re right! Hell Bent was on the Japanese thing, although now it’s on the remaster. Well that settles it! It should have been on there! I have this on vinyl. Need to play it again to see if I agree! Do it! I have it on vinyl too. Ok for me Priest started with 79s Unleashed In The East,British Steel,Point of Entry( my fav) Screaming,even Defenders and than ahhhh….Turbo….wow how about a shift from British Metal to what I would say North American Metal…..I agree when I first heard Locked In I thought cool but I don’t know about the whole Zztopish synth sound on a whole record. Private Property I thought came across better on the live album( all time brutal cover for a album) as did Rock Tou All Around The World….. But hey u wanna keep up with Joneses of the world circa 86 so perhaps a little trend following was in the cards…or the record company was a knocking….! Than 2 yrs later Maiden nails out a ton of synth sounds on 7 th son and they sound cooler….technology advancing?…….or just suited to the songs better….. I like the ZZ Top comparison Deke. I’d never thought of it that way before. Anyway once again thanks for your thoughts! And also funny that you mention the awful cover art for Priest Live. I read somewhere else that it’s one of the worst album covers of all time! Good point about the shift from British to American style. And the ZZ Top comparison is great too. Never minded the Priest Live cover though. I always thought it was simple and classic looking. Don’t love it by any means but never thought it was awful. Dude! Just occurred to me that we need some context here: where’d this Priest record come from, in the middle of your Maiden reviews? Aren’t you meant to be doing all of the Priest records, in a series like KISS and Maiden, when yer done the Maiden? So why cough up Turbo now? Just ‘cos you were listening to it and felt like it? That’s cool, but it’ll mess up your order when you get to the Priest! Or maybe yer not planning to do the Priest in a series? Just cos I was listening to it and felt like it. Yes. I’m undecided on Priest. Or at least I’m undecided on how far away a Priest series is, I’ll put it that way! There was a time in my life when this was my favourite album Of All Time. Yup. Of All Time. Very much a more metal ZZ Top and (needless to say) this was before I had heard any other Priest records. They even wore more colourful leather clothes to fit in with the Glam Metal fashion of the day. Nowadays I prefer early Priest, but this is a quirky addition to their catalogue. So the question remains: which is their worst record if not this one? (This sold very well incidentally – on the back of a tour and the commercial rise of hair metal). This was only my third Priest record, so I guess for a while it too was my favourite Priest. I have had disagreements about this with people in the past but I always liked their image from this period. I wanted Halford leather coat so badly! I was just glad that he’d grown his hair. Which is their worst? My opinion on this has changed over the years. Back in in the 80’s I would have said Rocka Rolla. Now, I would probably split it into two – of the Halford era, I would say Ram It Down. Overall, I have to go with Jugulator, hands down. My favourite song on Turbo!